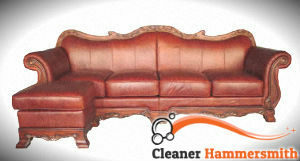 Leather pieces of furniture are luxurious investments which need effective cleaning implemented by professionals. 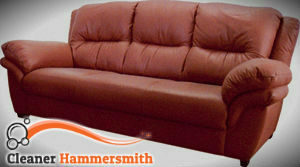 We carry out safe and reliable sanitising of all kinds of leather sofas including small, one, two, three or four seated. Our staff have the necessary skills and knowledge to carry out the best possible cleaning methods for every sofa. They have experience in successful sanitising of nu-buck, pigmented, aniline, semi-aniline, suede, bi-cast and many other leather types. Get in touch with us to book the leather sofa cleaning we offer in Hammersmith and we will prolong the lifespan of those valuable possessions of yours. Our cleaning staff are supplied with high-quality detergents, microfibre cloths, conditioning products and sprays which they use to sanitise the different types of fabrics. Whether you have aniline, semi-aniline, pigmented, nu-buck, velvet or other kind of leather sofa with one, two, three or more seats, we have what it takes to restore its lustrous and clean condition. It is necessary to carry out professional cleaning of leather pieces of furniture done by specialists so that they won’t get damaged or cracked. Our leather sofa cleaning services can be used by the residents living in the Hammersmith area and in the surrounding boroughs. Whenever you notice darkening and staining of your leather sofas, call us to take care of them. Our specialists in leather can identify the type of the material and choose the most appropriate detergents and moisturisers for it. You can be sure that you will get excellent leather sofa cleaning from our company, operating in W6, which will prolong the lifespan of your furniture.